Lil' Blog and More: Review: CSN Stores. Heres the best part: By purchasing from CSN you can save quite a lot of money. I'm sure you all know that the wonderful Le Creuset is not cheap. It is pricey, but worth it! Well CSN helps you with that problem! Before we had ever heard of CSN Stores we were buying things at the high price. 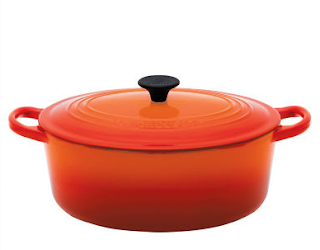 We actually bought ours Le Creuset for a little over $300 (Plus Shipping!) but you can get the exact same Le Creuset Oven for only $270 with free shipping. I wish we would have known! With all the savings we could have actuallu bought another one! But at least now I know, and you do too! :D! If you are in the market for a new Dutch Oven then you've got to check out CSN. The deals are great, and I am positive you will save lots of money! Love my Cocottes? You can find some great deals on Cocottes at the CSN stores as well! Disclosure: CSN is providing me with a gift certficate to there amazing stores in exchange for this post. All opinions expressed are mine and were not influenced in anyway. Love dutch ovens! Have never tried the CNS stores though... and that was a very good deal!